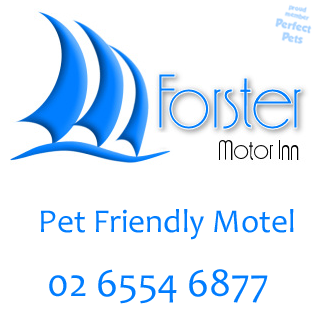 Pet Friendly Motel Accommodation in Forster - Forster is a great place for a family or a couple on vacation or even as a respite stopover. So if sticking to a budget is important to you then Forster Motor Inn is the best place to stay. Forster is just a 3Â½ drive from Sydney. We are located in the main city centre and only a 5 minute walk to the famous Wallis Lake and the ocean and a couple minutes walk to the shops. All rooms have a TV, toaster, kettle, microwave, & fridge. Most have a kitchenette and all are equipped with cutlery and crockery. All rooms now have reverse cycle air-conditioning, iron and ironing boards, and an allocated car space. We also have a beautiful pool and offer free WiFi. Please understand that since we love animals we do not believe they should be left unattended in the rooms, nor do we allow more than one pet per room. For bookings please call us or send us an enquiry.